The tale of the helicopters; part 2! If you read our blog last week (the tale of the helicopter, part 1) you will know that the upland team have been growing in excitement for the arrival of our helicopter. Well arrive it did and boy would we have been excited! Only something else arrived at the same time... high winds, poor visibility and rain. Not the best combination for flying stone attached to a helicopter up into the fells. It was even more frustrating as the lift up at Blea Tarn was going to be filmed by ITV as part of a new series on the National Trust to come to your screens later in the year! Despite the inclement weather we still did plenty of filming with the crew. We took them to some of the paths around Blea Tarn and showed them what we do and the issues we are faced with in the uplands. Hopefully they got some good footage and we'll not have embarrased ourselves too much! Finally come Friday the forecast had improved enough for the helicopter to get off the ground and move some stone, so it was all systems go, for us that meant we had just a few hours to try and get all the stone lifted at Blea Tarn before the helicopter had to go out west and lift stone onto Yewbarrow. Can you spot the ground crew and all the bags to be moved?! Because time was tight, 3 of us were lucky enough to have hitched a ride from the valley bottom up to Blea tarn. Although it only lasted just over a minute it was fabulous to see the fells from a different perspective. From this point though it was all down to the pilot and his ground crew, our jobs were merely crowd control to ensure the pilot had as easy a job as possible, thankfully it was pretty quiet! Supervisor Ian however, also played a key role as he was the man the pilot was aiming at for dropping the stone. I'm not sure whether it would be a scary or thrilling place to be, but the pilot had a good aim and Ian is pretty experienced so it all went without problems. 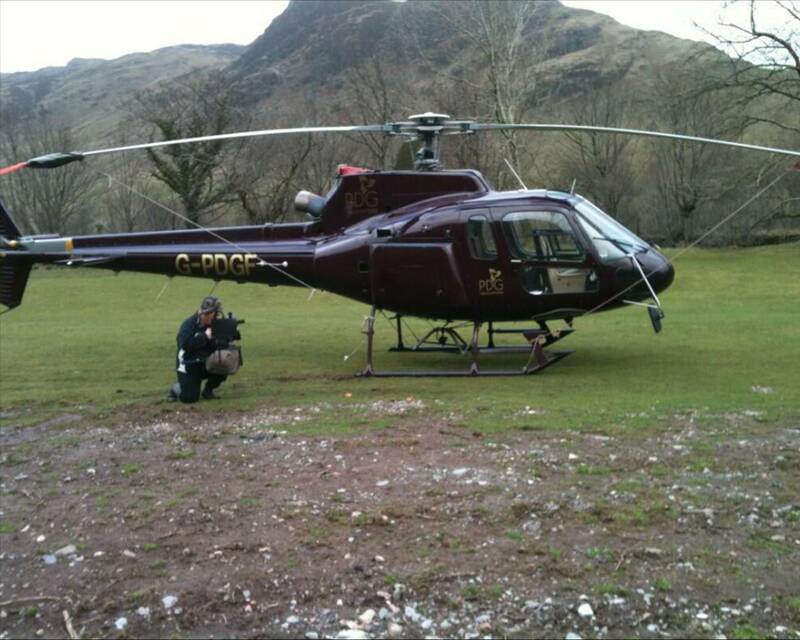 Ian in the yellow jacket directing in the stone, with the ITV film crew in the back ground! At the other end of the lift, the ground crew has to attach the bags of stone to the helicopter one by one. This means that as the pilot comes into the load site he just has the ground crew's hand to aim at, into which he will fly the chain that is attached to the underside of the helicopter. The ground crew then threads the strap through all 4 loops of the heli-bags filled with stone and hooks it onto the chain. With a thumbs up the ground crew heads to find the next bag while the pilot wheels away to the drop off site, where he will release the bag once he is happy with the placement. Ground crew off to find next bag, pilot off to drop off site. Can you spot the mirror the pilot uses to help him see? It's amazing to watch this all happen, especially as it is all so seemless! Whilst on crowd control there are normally plenty of people to talk to who are pretty interested to hear what's going on and why we use helicopters. We do however have to remind them that it's not every week we get a ride in a helicopter and our normal mode of transport is our very own feet. Still when we can we all enjoy the opportunity to get a ride and we normally end up with lots of photos! All in all it's been an exciting week and because of the weather we're looking forward to the helicopter returning later in the month to finish the jobs that we couldn't fit in this week. If you want to keep up with what happens and what else the team gets up to then please follow us on twitter @NTlakesfells, where we can we try and update daily! 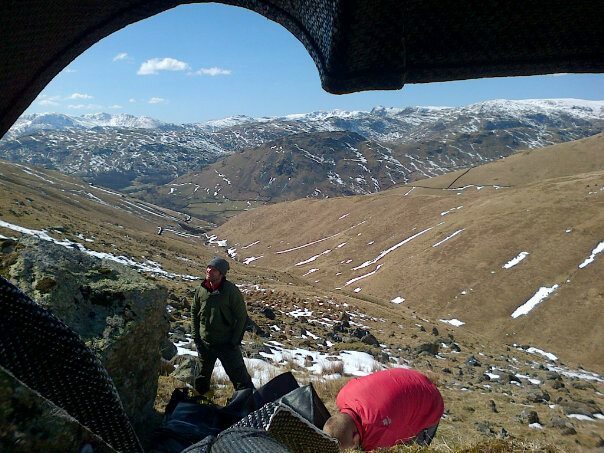 As the snow melts away and we emerge into spring, the Upland Ranger team can normally be seen to be getting pretty excited, and that's not down to the weather supposidly improving as we come towards summer...instead its because the prospect of a ride in a helicopter gets ever closer! Before that however, there is plenty to be done. 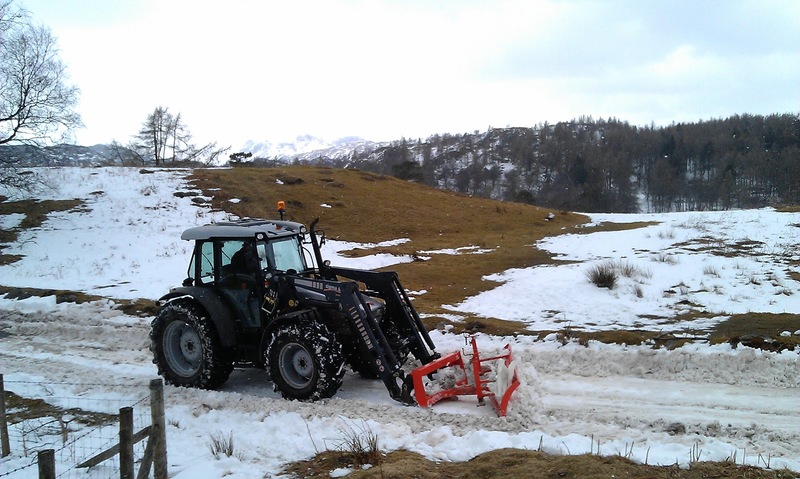 Helicopter lift are undertaken annually and allow the Upland teams to get materials onto work sites in the high fells. This material is largely stone that will be used to build pitched paths (stone steps) and drainage, but we also fly up sheds and tools. This year our team is filling bags for 3 main projects at Blea Tarn, Fairfield and Swirral edge. Each bag we fill will contain around 500-800kg and we need to fill approx 270 bags, all of which get carried up by staff to the stone sites. That roughly means that between the team we'll have moved nearly 162 tonne of stone, that's equivalent of moving the biggest bell in Big Ben 10 times! So alongside looking excited we also look pretty weary! Once the bags have been carried up the fell it's time to start filling them all with fairly sizeable stone, that will be suitable for the work it is intended for. So in the case of stone pitching, we look for stone that has a good, flat walking surface, alongside what we call a good face, which is the part of stone everyone will see as they walk up the steps. Before all this however we take advantage of the empty heli bags to get out of the wind and have us a brew! Refuelled and ready to go we fill the bags, getting the largest stones in the bottom four corners, medium stones on top of that and small stones filling in the gaps. A gold standard for a day of bag filling is 10 bags per ranger, but that can vary according to the nature of the site. For example on the site at Tongue Ghyll, there was a footpath directly underneath, so fillling the bags did take longer as we were being extra careful! Spot the rangers and count the heli bags! This year there was a particular last minute rush on filling the bags because the snowy weather made getting to the sites a lot more difficult that normal, but with a big push and some help from the Fix the Fells volunteers we managed to get them all filled, and could now start looking forward to the arrival of the helicopter and the beginning of the lifts. Only as with the bag filling, the weather can either be our friend or our worst enemy, tune in next time to find out what happened next...! So far this year we’ve been exceptionally lucky with the weather. We had one day where we ended up building the drystone wall in the ‘Outdoors indoors’ room (see 26th March entry) at Wray Castle due to heavy snow preventing us getting to the real wall we were intending to go to, but apart from that it’s been fine every time we’ve had volunteers out with us. Not a usual walling problem - fitting stone next to a skirting board! So this run of decent weather (ie not raining) has meant we’ve been able to get back down to our ongoing project putting the new path in on Wray Bay, just down from the castle. 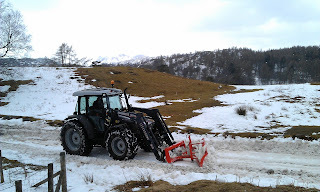 We started work on this way back in August 2011 and have been plugging away, working towards the castle ever since them. Landing party! Brathay Trust arrive at Wray Bay . In a first for us, the weather was so good that on one of the days the group we were working with arrived by canoe! They were all local young people staying at nearby Brathay Hall and working with us as part of a Princes Trust project. They’d all never done anything like this before and were all saying they would be bringing their families back to look at their bit of path. The National Trust’s new director general happened to be at the castle on the same day so the group also got to give her a lesson in how to use the power barrow – which we think was probably a first for her too! It’s been great having a big project like this to work away at, but it’s coming to and end now. A recent day working there with Littledale Hall Therapeutic Community, a residential rehabilitation centre from near Lancaster, saw us put the final turf in place on the side of the path. Quite emotional really …. Thunderbird 2 to the rescue, as John clears the road. It was another case of Rangers to the rescue as we spent a day clearing the road up to Tarn Hows after the recent bout of snow. We had the Mountain Goat getting stuck, a member of the public throwing over their Landrover and a number of determined drivers battling through the snow to reach the tarn. 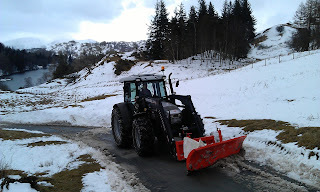 When we began the road was in a treacherous state, but after a hard days work from John, Stuart and the tractor, we successfully re-opened the road. Its a damn sight easier than shovelling by hand! Even though there is still snow on the ground Tarn Hows has been extremely popular over the Easter break so far, with many families taking part in our annual Easter Egg hunt and stopping to watch the hungry birds taking advantage of the bird feeding station beside the car park. The old fashioned hand power still has its place! If you've never been to Tarn Hows, come and check it out. Its a great place to introduce your family to the countryside with well surfaced wheelchair friendly paths and a lovely relaxing walk with lots to see along the way. Come and see the picturesque designed landscape in the awe inspiring backdrop of the lake district fells. I still think this and I work here daily, so surely it must be good.